What happens if I think that the ice sculpture and chocolate fountain at your event are off the hook? How do I tell my facebook friends and my twitter buddies? I have to pull out my phone, take a picture, enter a short message and upload it. I miss valuable networking time at your event – plus my iphone will probably autocorrect what I type into some gibberish. In my opinion, the greatest challenge to spreading the use of social media at events is getting people to express themselves digitally without having to use a laptop or handheld device. What would happen if you could give people a simple way to “like” something in the real world without having to use a laptop or mobile device? Here are three videos of how events are using RFID and Social Media to allow attendees to express themselves digitally. Why is this the next big thing? There are four reasons why I think this technology will be the next big thing for social media in events. (1) Ease of Use for Attendees – It is so simple to swipe a wristband or badge against a touchpoint that automatically updates your status. You take the technology complexity out of the experience. (2) Awareness – If your brand or event is new and lacking widspread awareness, this is the perfect way to tap into the Digital word of mouth power of social media. (3) Data – You get data about what people like at your event. Plus, you can collect data on what was shared with others and clicked on. When you combine this data with other landing page, registration for newsletters, etc. data to see how it contributed to driving people into your marketing funnel. (4) Widespread application – This technology will work for the galas, weddings, conferences, tradeshows, national sales meetings, association conferences, parties, etc. In my opinion, allowing people to express themselves digitally without the need for a device is the next evolution in the integration of social media in events. Now you know where I stand. What do you think? What’s the next big thing for social media in events – if this isn’t it? Are You Multiplying The Value of Your Meetings? When you get ready to start planning your next meeting, is your plan to make an incremental change or take a giant leap? My guess is incremental change. And, I bet you then go look for new ideas that you can include in your event. Right now you might be excited about QR codes, mobile apps. and social media. What would it mean to your organization if you could multiply the value of your meetings and events? Think about that question for a minute. How would your attendees feel if you sent them home with 3X the educational value for the same cost/effort? How would your leadership teams feel if you could generate 3X the output from annual top management meetings for the same cost/effort? How would your sponsors feel if you could send them home with 3X the qualified leads for the same cost/effort? How would your employees feel if you included them in 3X the important decisions affecting the future of your company? I bet your stakeholders would be ecstatic, if you delivered a giant leap in meeting performance. And I bet they would throw you a ticker tape parade and put your name in lights. Here’s the big question: How do you do it? Which part of your meetings need rethinking in order to multiply the value? This is a tough one. If you talk to 1,000 people, you will get 1,000 different answers. Ask yourself these questions: (A) what would it mean to your organization, if you could multiply the value of events? (B) How would you measure it? (C) Where would you invest time and energy in rethinking your meetings? (D) For those of you that are already doing this – what is working and where are you running into challenges? What would happen if you transformed your event with a game? 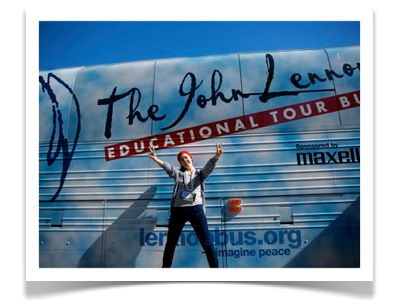 Would it inspire creativity, problem solving and innovation among your attendees? Would it energize everyone? Or would it be so stressful that it wouldn’t be worth the effort? 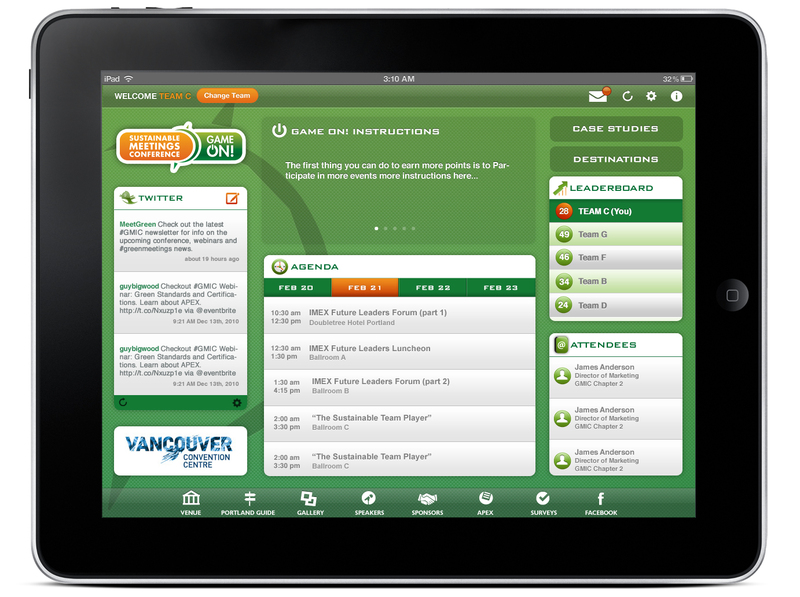 This week, the Green Meetings Industry Council used gaming to transform their learning and communication platform. GMIC designed an interactive and collaborative game that created incentives for attendees to (A) apply the learning from the conference in real time, (B) support sponsors and exhibitors and (C) share the key messages of GMIC via social media with the rest of the world. > Complete a Group Case Study project that helped integrate all of the learning. The Leaderboard kept track of the points earned in a pseudo real-time way. Some of the points were recorded digitally. While other items, like the case studies, had to be manually scored and entered into the system. You could check the leaderboard anytime by logging into a mobile application and seeing where your team stood. GMIC pre-loaded Team profiles into the system to help get teams started. Then each team self-formed and added members to their team roster in the game. As a virtual participant, I couldn’t see who was on which team. So I had to get some feedback on teams from Twitter. 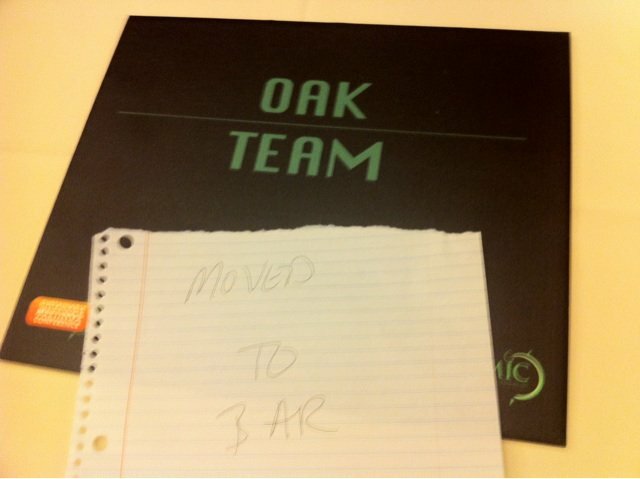 Greg Ruby (@gregruby) and Brian Hunt (@brianhunt04) told me that Team Oak was the best. So, I accepted their invitation to join Team Oak. Brian and Greg were right – we were good. The system that kept all of this together was an iPad app and a mobile app made by QuickMobile. Each team was given an ipad that had the official team app on it. This app allowed the team to do a lot of different types of data entry and engagement activities. As a remote participant – I had a mobile app that helped me see how Team Oak was doing. I couldn’t enter any data into the system, but I could follow along with my team. This gave me access to the leaderboard and the case study as well as various other items – like a list of attendees. Note: If you did use the iPad application, please tell me about your experience in the comment section below. I would be interested in hearing how it worked for you and your teams. Myself, Tahira Endean (@tahiracreates, Vancouver), Brandt Krueger (@brandtkrueger, Minneapolis), Sanne Jolles (@sanne_j, Amsterdam), Katherine Manfredi (@kmanfredi, Florida) and various others were active virtual participants. In one form or another, we were able to join teams and participate in the group projects onsite. I really appreciated this opportunity to be included in the group activity. It would have been very easy for the organizers to say no, because it really wasn’t part of the original plan. It turns out that GMIC literally embraced a message from Event Camp Twin Cities: “Experimentation is our get out of Jail Free Card…if we weren’t having tech hiccups then we wouldn’t be innovating.” With that as guiding motto – they were willing to let attendees create and push the boundaries. For Team Oak, we skyped in Brandt Krueger and myself into our team meetings to discuss the case and various strategies. Brandt Krueger skyped in via skype audio onto the team iPad. He was placed in the center of the table. I was video skyped in and took a seat around the circle. John Chen (@bigkid) and Greg Ruby (@gregruby) were gracious enough to help put it all together. I liked the experience because I could observe the non-verbal communication from the other attendees that accompanied what they said. However, it was not always possible to hear all team members all of the time. Did I mention that we met at the bar? Here is a video interview with some of my thoughts on being a virtual participant. Tahira Endean (@tahiracreates) had an entirely different experience. They had problems getting skype to make a good connection. As a result, she used email and text chat to participate in the group. This made her experience dramatically different from my own. Also, it changed the way that the communication dynamics between her f2f team and remote participants. The case study was brilliantly designed. It challenged us to practice: objective setting, destination analysis, pricing, business analysis, meeting architecture and establishing a measurement strategy. I really appreciated the multiple dimensions that were inside of the case study. Elizabeth Henderson (@ehenderson) did an amazing job. In my opinion, one of the most important elements in a competitive game is the debrief. This is the part where you find out if you won or not – then figure out what you did wrong. One thing that struck me right off the bat – was Paul Salinger saying that he let us down on objective setting because none of us did it correctly. The irony is that I remember him asking several times on day 1 – do you all know how to do this? The entire room said we do. I guess we didn’t afterall. Our team ended up second overall and third in the case study. While I was proud of our efforts, Team Magnolia rocked the case study. I would have been interested in hearing them talk about their proposal and get their take on some of the high points. Inspiration for the game design came from the book Total Engagement by Byron Reeves and J. Leighton Read. (http://www.totalengagement.org/) I haven’t read the book – but plan to pick it up soon. While the game was cool – one of my big take aways was the wonderful welcome and feeling of inclusion that I got from the organizers and attendees. They went way beyond the call of duty. I would like to thank Paul Salinger (@psalinger), Midori Connolly (@greena_v), Mitchell Beer (@mitchellbeer), Holly Duckworth (@hduckworth), Elizabeth Henderson (@ehenderson), Greg Ruby (@gregruby), Roger Simons (@rog_simons), Brian Hunt (@Brianhunt04), John Chen (@BigKid), Gina Broel (@gbroel), Ian Lipton, Joseph Chan, Daniella from Team Oak, Team Oak, Lisa Kraus (@LisaKraus), Andrew Walker (@eco_efficient), Jill Drury (@jtdrury), Tahira Endean (@Tahiracreates), Heather Teegarden (@hteegarden) and many others for making me feel part of the GMIC Family. Your kindness exceeded my expectations 20 fold. Through my virtual window, I can confirm that this was a very cool event. The tight integration of the game into the event objectives helped make the gaming element a success. While the technology was slick – the real key in my mind was a good game design around the objectives and content of the event. Tell me about your experience. What did you like most about the gaming elements? What would you like to see improved? Do you think this format could scale up to 1000 attendees and beyond? Next week’s Green Meetings Industry Council Annual conference (Feb 20-23, 2011) sounds like it will be really cool. They are complimenting the traditional lecture model with an interactive and collaborative games model. From what I understand – the idea is to send attendees home prepared to think strategically about building sustainable events. To execute this vision the GMIC team is getting everyone to work together to solve problems rather than just listen to speakers talk. The idea behind the event is that you will go home having looked at building sustainable events from several different perspectives. Not only will you have heard about the strategies – but you will have been able to practice them. Since, I am not really doing this event justice – here are snippets of Paul Salinger and Midori Connolly talking about Game On. [Register here] Obviously you can attend in person. The event is in Portland. For those of you that want to save your carbon footprint (and your greenbacks) there is a FREE virtual pass available. Since, this conference fits with my innovation wishes – I plan to attend online. I will be looking at how the organizers are integrating the games, ipad applications and case studies into the event design. I will be happy to share what I learn with all of you. Tell me about your own experiences (positive or negative) using games in learning. Are other conferences doing this? What is the reaction from the attendees – near term and long term? What comes to mind when someone says – Learning Lounge? For me, I think of a sterile library-like-space with few people, little noise and empty chairs. I’m extremely pleased to tell you that PCMA‘s Learning Lounge was anything but. It was noisy, engaging and full of life! This experimental idea gave us a glimpse into the Future of Meetings. It showed us new ways to include and engage a large number of attendees. And, showed us how we could incorporate the back of stage into our event experiences. Luckily I brought my Flip Camera and made a short video. Have a look. The format gave approximately 100 additional attendees an opportunity to share ideas and expertise with their peers. The open space allowed you to “sample” a bunch of ideas and move between theaters very quickly. The interview studio sessions were recorded and broadcast on the internet allowing people at home to participate as well. The use of 3D structures and décor created intimate spaces out of a huge open space. Having the Learning Lounge right next to the general session helped people arrive early, network, learn and get excited before the general session started. PCMA’s Learning Lounge was a high-energy, high traffic space that gave a bunch of attendees an opportunity to participate in the event. This is an idea that you should consider for your next meeting or event. Have you experienced anything like PCMA’s Learning Lounge before? Have you tried anything similar in your own events? And, if you were at PCMA last week – what did you think of the Learning Lounge? PS. This is a perfect example of Wish #2 coming to life! While natural disasters throw an “unplanned” monkey wrench into the normal rhythm of our events, they don’t have to stop us from meeting. I have been impressed with the role that event technology and social media have played in events during natural disasters like snowstorms, volcanos and floods this year. Some inspiring and innovative people, like Lindy Dryer from Social Fish, proved that we could create opportunities out of the madness. Last week at EIBTM in Barcelona, Ruud Janssen and I highlighted a few of these examples and shared some advice with the audience on what they could learn from these events and take back to their own events. While our presentation concentrated on the events angle, we discovered an amazing open source crowdsourcing platform called Ushahidi in our research. The developers designed a full portfolio of technology to help crisis teams collect, filter and process real time communications from text and Twitter. Then, turn those messages into actionable information that could be used for rescue missions, etc. We don’t have to let a crisis stop us from meeting. There is a way to create opportunities despite the madness. What is the most interesting use of event technology or social media use that you have seen to help an event during a natural disaster in the past two years? Shameless Plug: The slides above were picked by Slideshare editors to be one of 14 featured presentations of the day on Friday, December 4, 2010. Yes, Ruud and I did feel cool! Disclosure: My Trip to Barcelona was Sponsored by EIBTM. This weekend, I attended Event Camp East Coast. It was organized as a structured unconference and followed the Conferences that Work model. Conferences That Work is one of many group processes that put the participants at the center of the event to establish common ground, build community and create something together. There was no agenda. There were no powerpoints. No overhead projectors. And no presentations. There were no speakers. There was no looking at the back of anyone’s head in sessions. There was no production equipment. No stages. No livestream. And only a light twitter stream. The most advanced technology at the event was EventMobi from Bob Vaez. The event was unplugged. Yet, we were so plugged in. Two scribes then took notes on flip charts and posted those around the room. This process was lengthy and tiring, but it helped me get to know some key facts about the other attendees. This came in handy once we cracked open the wine. While consuming wine and getting to know each other better, we started to build an agenda. This was the second step. We created the agenda by coming up with discussion topics and then writing our name down beside each topic. If we had expertise and willingness to lead a session – we could indicate that with a letter code. Then, while the rest of us continued to talk and network – a group of 6 people went into the “serious room” and sorted everything out. What emerged in the morning was a 14 session program that tapped into the collective wisdom and talents of the people that we had at the event. For some people, this step was too unstructured and too slow for their tastes. For me, it gave me plenty of time to have productive and engaging conversations with a bunch of different people – including some who were skeptical. The next morning was a lot of fun! The session rooms were setup with chairs organized in a circle with 1 flip chart. The session leader would kick off the session with a few points and then a dialogue would take place. Each room had a circular seating arrangement. This made sure that we were all equal. We all had an opportunity to ask questions or make comments when we wanted. Since, we knew each other – the dialogue flowed much smoother than if we were unknowns in the session. While we didn’t get a powerpoint deck with 62 slides from each presentation to take home – what we did get was a bunch of new resources for answers, help and support. Those resources were our fellow attendees. The people. The final sessions gave us an opportunity to take a step back and reflect on what we had seen, experienced and learned. Then we could choose to share those insights with our colleagues around the room. (We had moved from “fellow attendees” to colleagues at this point). Since each of us came from a different place we took away something different. I have never been to a conference where I felt like I got to know so many new people so well. We shared together, learned together and established common ground. I thought it was remarkably empowering to get to know the people around me and then say “I want to learn from you” and then go have a discussion with 10-18 other people that feel the same. This isn’t the type of event format that lends itself to webcasting. A video stream here would have failed – badly. It would have been like watching the Ann Arbor City Council on public access television – people would have left after 3 minutes. Then, they would have complained that the livestream was no good. It takes courage to put on event like this. It takes courage to register and pay for an event like this. Yet, I would attend again – because the networking and collaboration were so powerful. We have a bunch of different formats and technologies that we can use in our events. Your selection of event format should depend on your objectives. Not all formats are good for learning. Not all conference formats are good for engagement. Not all conference formats are right for livestreaming. Event Camp East Coast was great for building a peer-to-peer community. Are You Thinking Outside the Room? Bruce MacMillan wants MPI members to look at their meetings and events in a new way. He wants them to look at new ways of connecting people to ideas and content. He wants them to start thinking outside the room. That’s the message that he brought to MPI Members from Minnesota and Wisconsin at the Midwest Regional Conference in St. Paul, Minnesota, today. I hope that he continue to share this same message with all chapters around the world. Bruce brought more than theory. He brought three “A” list events that would inspire anyone. I have summarized each event below – so you can be inspired too. Luca Favetta and his team outdid themselves with this event. They built a hybrid event that linked two hub cities of Frankfurt and Orlando and integrated thousands of people online. They used TV studios to create additional content and connect people to a broader audience. In 2009, Cisco’s Global sales event was in danger of being cancelled. Instead of cancelling the event, they created a virtual event. They pulled together over 19,000 people and created a remarkable case study in the process. They created interactive games, like the Threshold, to get thousands of people involved and participating. TED does four things to connect people to ideas and content outside the room. First, they use an 18 minute format for their presentations. Second, they regularly publish videos on their websites. Three, they have TEDActive which is a simulcast event for people that could not attend the real TED event (See Interview). Fourth, they have the TEDx series of self organized events that help connect people to the content. What comes to mind when someone mentions the TED Conferences? 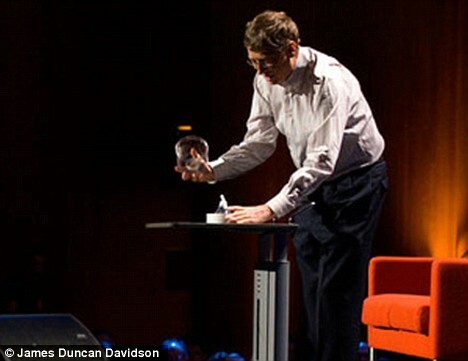 Do you think about a specific presentation – like Bill Gates presentation on malaria? You know the one – where he opened up a jar of mosquitos in the auditorium. Then he said – malaria doesn’t need to be a poor person’s problem (watch video). Or do you think about an endless supply of smart people sharing great ideas? Or do you think of cool, inspiring videos that are free to watch and easy to share? Regardless of what comes to mind first – you eventually draw the conclusion that TED is awesome! Have you ever wondered how they create this magic? Have you ever wondered what they are doing that you aren’t? Recently, Mike McAllen and I got a glimpse inside of TEDActive from Sarah Shewey of Pink Cloud Events (pictured above). Sarah joined Mike and I on a recent installment of Meetings Podcast Going Digital to talk about what they are doing to make the TEDActive Simulcast an awesome experience. For those of you that want the highlights from our conversation – Read on. TedActive is the simulcast event that is tied to the main TED Conference. TEDActive attracts people that are ready to create action around the ideas at TED. This event is much more than watching TV. They weave real talks (that are given by real people), social activities and collaborative activites into the experience. These activities help TEDActive participants establish community and create a unique experience of their own – beyond watching the simulcast. The main conference room has a ton of different seating options. There are beds, bean bag chairs, lounge chairs, and tons of screens all over to watch the TED Talks. The environment is designed to breakup the big room into smaller groups of 4, 8, 20 or 60 people. If you get a bed – your simulcast screens are on the ceiling (Pictures). The event attracts more than 500 people. It’s a simulcast and a real event at the same time. Pretty cool, huh? Why are TED Videos So Engaging? TED works with speakers to create awesome presentations and to have stage presence. Then, they use about 8 different cameras to film the videos. The shots are positioned so that they will be engaging to people watching online. Sarah makes a point of saying that they use closer shots to make things more intimate. They rarely use the long shots. Why does the Simulcast Event Work? Live host is the glue for the simulcast. Localize the event with other activities/experiences and create community. Coach the Speakers on their delivery. Broadcast the Video and the slides. Treat the simulcast as a special event. Of course, she didn’t talk in bullet points – she elaborated on most of these points in detail. You should go listen to the podcast to hear what she had to say. TED rocks! But, you knew that already.